The 2010 ADA Standards for Accessible Design provide specific criterial for knee clearance. But what is knee clearance and when does it apply to an element? 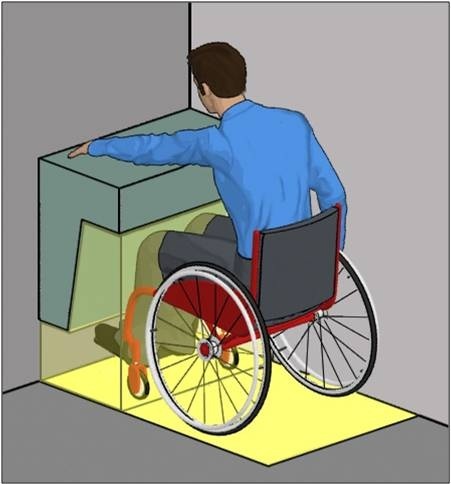 Standard 306.1 [Knee and Toe Clearance] General, states, “Where space beneath an element is included as part of clear floor or ground space or turning space, the space shall comply with [Standard] 306.” Standard 306 provides ADA guidelines for knee and toe clearance at an element. The diagram on the right is representative of knee and toe clearance at a frontal approach to an element. 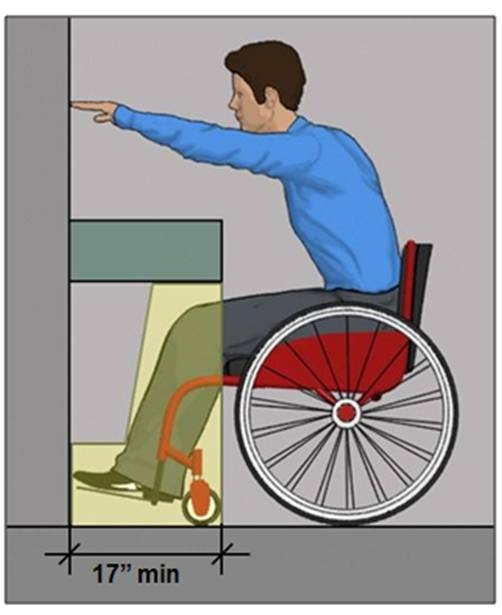 Knee Clearance measurements pertain to handicapped individuals in a wheel chair making a front approach to an element. So what this involves is the actual space for the knees of a handicapped individual to go when they roll up to the element, such as a sink or water fountain. Standard 306.3 provides guidance specific to Knee Clearance. Standard 306.3.1, General, states, “Space under an element between 9 inches (230 mm) and 27 inches (685 mm) above the finish floor or ground shall be considered knee clearance and shall comply with [Standard] 306.3. Standard 306.3.2, Maximum Depth, states, “Knee clearance shall extend 25 inches (635 mm) maximum under an element at 9 inches (230 mm) above the finish floor or ground.” Standard 306.3.3, Minimum Required Depth, states, “Where knee clearance is required under an element as part of a clear floor space, the knee clearance shall be 11 inches (280 mm) deep minimum at 9 inches (230 mm) above the finish floor or ground, and 8 inches (205 mm) deep minimum at 27 inches (685 mm) above the finish floor or ground.” Standard 306.3.4, Clearance Reduction, states, “Between 9 inches (230 mm) and 27 inches (685 mm) above the finish floor or ground, the knee clearance shall be permitted to reduce at a rate of 1 inch (25 mm) in depth for each 6 inches (150 mm) in height. Standard 306.3.5, Width, states, “Knee clearance shall be 30 inches (760 mm) wide minimum.” See the diagram below for a representation of these standards. The diagram below is an example of this standard in a practical application. Knee clearance and reach over an object. So for people using wheel chairs knee clearance is a big deal. The most common elements I see where knee clearance is compromised is at public dining tables and public toilet room sinks. Toe clearance is related to knee clearance and will be discussed in a later post. Thank you.